I've put together this collection of quotes charting the life, career and environment of the late Samuel Wanjiru over the years by those who knew him and helped make him what he was, including Tsutomu Akiyama, Stephen Mayaka, Koichi Morishita, Takao Watanabe and Wanjiru himself. Wanjiru's achievements made him a great source of pride in Japan, as close as one can come to being considered one of their own. 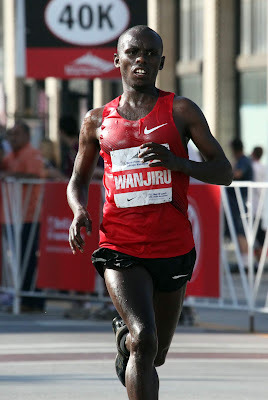 "Wanjiru arrived in Japan on May 4, 2002. I was the one who went to pick him up. When he came he was only so-so, but even in high school he became strong at 10000 m, and at the half-marathon too. 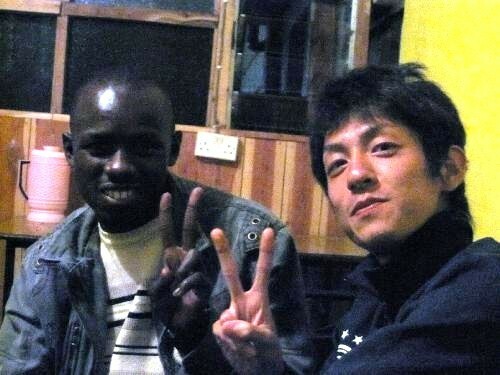 Wanjiru succeeded at the marathon because he was trained in Japan. He would never have been able to do this kind of running if he had stayed in Kenya. Athletes raised in Kenya don’t have the same kind of mental toughness. They come here and they learn discipline, focus, they begin to understand gaman: absolutely do not make a move before 30 km, and the like. From 30 to 35 km everything is going to change, that’s something Wanjiru learned in Japan. He grew up Japanese. In my opinion he has the strength to be running 2:04 for the marathon." Samuel Wanjiru and Stephen Mayaka post-Beijing. "Some Kenyans who are coming to high school, they are not very competitive. They are not very fast, so they come and they start the system and train very hard and become someone later. Like Wanjiru, when he came he was not strong. He was doing it three years, four years, and then he came to be strong." "Ayaya. I've got a poster of her up in my room. I like her because she's interesting." Wanjiru, talking about Aya 'Ayaya' Matsuura when asked by a TBS reporter about his favorite Japanese starlet before his pro debut at the 2006 New Year Ekiden, three and a half months after setting his first half-marathon world record. 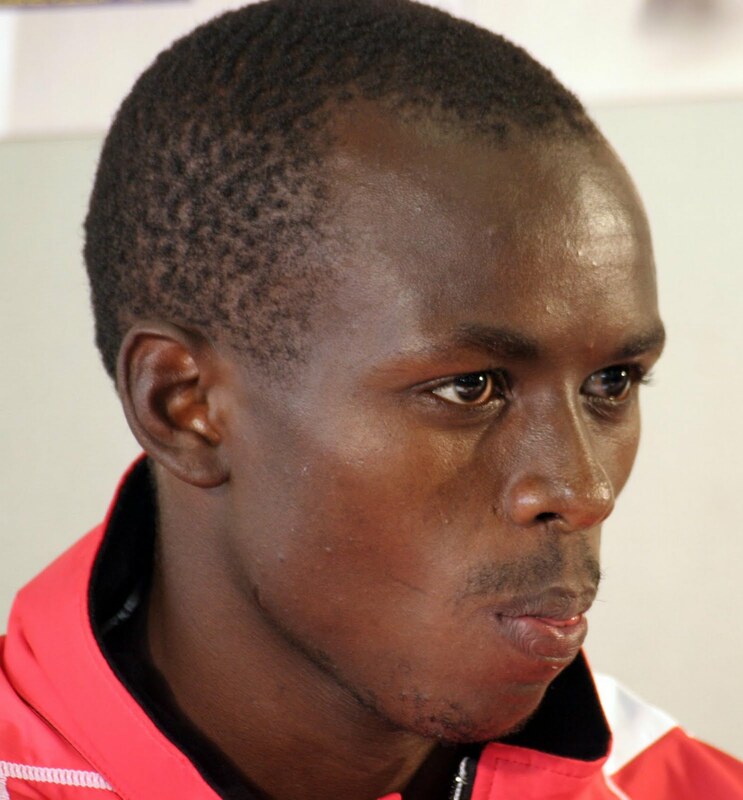 Kenyan half-marathon world record holder Samuel Wanjiru has been forced to withdraw from his planned full marathon debut at next month`s ING New York City Marathon. As a member of Toyota Kyushu`s jitsugyodan running team, Wanjiru is required to be physically present in Japan for at least 180 days per year. Wanjiru has only 10 days` leave time left and will expend this allowance at the World Road Running Championships in Udine, Italy next week. Toyota Kyushu coach Koichi Morishita stated that Wanjiru has not trained specifically for a marathon at this time and that Toyota Kyushu requires him instead to focus on preparations for the national corporate ekiden championships on Jan. 1, 2008. "This isn`t just a half times two." "This will be the foundation. I want to run the marathon in the Olympics and so I want to take a good first step toward making that a reality. This time I only plan to win in a 2:06. With the experience I gain in Fukuoka I will go much harder next time. I want to race with the patience of a Japanese runner." Wanjiru at the Fukuoka '07 pre-race press conference. Photo courtesy of Dr. Helmut Winter. On the 12.5 km fourth stage Samuel Wanjiru put on a stunning display of front running at the Kyushu Jitsugyodan Ekiden. Taking the lead after 4 km, Wanjiru became the first person to break 35 minutes on the stage. Wanjiru ran 34:40 to set the new stage record. Wanjiru will make his full marathon debut at the Fukuoka International Marathon on Dec. 2. "My body felt great and I had a lot of fun. This was good speed practice," he smiled. "I achieved my goal of a 2:06. It was tougher than when I set the half-marathon world record but I`ve gained the confidence I needed." "I think this was a mediocre performance for him, but I told Wanjiru, `That was good enough.`"
"I`m much more tired than yesterday. Ekidens and half-marathons leave me saying, `I`m beat,` but my whole body is sore now. I want to take a break for a while, you know? It`s been a great year. Next year I will top it with an Olympic medal." Wanjiru pacing teammate Yu Mitsuya to the fastest-ever 10000 m by a Japanese man on Japanese soil, 27:41.10, in Hokkaido on June 30, 2005. Click here for complete photo sequence by Tetsuhiko Kin. "Sam is a real professional runner. He is a good role model for the other team members. He can set a world record in the marathon, but I would like to emphasize winning over fast times. I like to coach a winner. Sam never gives up during the race. Such a characteristic is important for the marathon. If Sam is going to run a spring marathon, he has to start the marathon training before he fully recovers from his last marathon and he could be exhausted by the spring. Instead, I am thinking of him running his next marathon in the fall. He ought to run two more marathons as an experience, and then go for the fast time in his fourth or fifth marathon." "Morishita had a brilliant marathon career, having won his first two marathons before finishing second in the Olympics, but his career was cut short and he never ran another marathon after the Olympics because of a series of injuries. Perhaps, learning from his experience, Morishita is planning a long and fruitful marathon career for his star pupil." "I have no regret in running for a corporate track team. I enjoy passing runners in ekidens." 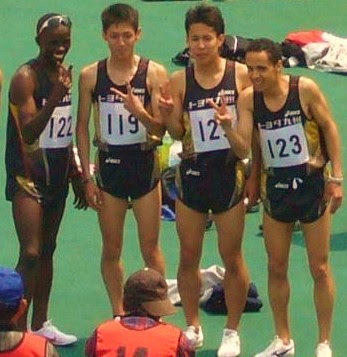 With Toyota Kyushu teammates after finishing 2nd in the 4x400 m relay at the Kyushu Jitsugyodan T&F Championships, May 19, 2008. Click here for complete photo sequence. "In the case of Philes Ongori there's an agent involved, so it's complicated. I think Philes would have made more money and had a better, more stable career if she had stayed here, but this agent probably told her, “You're good enough to win Boston. Think of how much money you could make if you win there.” Once an athlete hears that, it's all that's going to be on their minds. I think the agent was fleecing her, but she's old enough to make her own decisions and nobody can say whether it was the right move or not. In five years she’ll know if she made the right decision, but until then there's no way to know. The agent problem is a difficult one. A lot of them are Italians. You wouldn’t believe what the Italian agents are like. When it comes to the World Championships and Olympics, when the Kenyan federation is selecting the team, if an athlete isn't dealing with a federation-approved agent who is there to push the athlete's name to the federation…People like [David] Okeyo, the #2 man in the Kenyan federation, are the ones who make the decisions. The agents who have direct access to him will get their athletes on the national teams. I think this is one area where you can easily see the potential for some abuses. In this area I think foreign agents are intrusive and deceptive. I believe the athletes would be better off remaining with a stable Japanese team." "Kenya has not won a single gold medal in the Olympics. Our time has now come." "The speed of the falling water is constant. I think that is how a marathon race is supposed to be run on both sides of the halfway mark - consistently, like the water through the falls. Now is my turn and there is a lot of expectation from me in Japan and especially Fukuoka where I live. I know myself." On July 28, Team Toyota Jidosha Kyushu of Fukuoka Prefecture received a letter of resignation from its star runner, Kenyan Olympic marathon team member and half-marathon world record holder Samuel Wanjiru, 21. The letter was sent by a Tokyo law office and stated that Wanjiru would be resigning "for personal reasons." Wanjiru has been training in Kenya separately from the team since mid-July. Representatives from Team Toyota Jidosha Kyushu commented, "We have to confirm that this letter was actually sent by Wanjiru and that this is really his intention." "From now on I want to focus on the marathon by myself. I don't want to spend my time running ekidens." "We don't think he has moved to another company, but since this happened shortly before the Olympics we don't want to disturb Wanjiru and haven't made any attempt to contact him. When he comes back to Japan we expect to settle the matter." "Japanese people are too serious about everything and don't like change." "Up until the day before the Olympic marathon I hadn't decided whether to go fast or hold back a bit and run a little conservatively. However the first half went, I wasn't sure what would happen in the second half and I was afraid of it. I couldn't sleep well at all the night before the race, and I discovered that I had forgotten my race shoes in Kenya. I had to run the race in my warmup shoes, but it was OK because they were marathon shoes too. Looking back now, I think I had a lot on my mind and was pretty nervous, but as soon as I started I forgot about it all. The only thing I thought was, 'Who cares, let's go!' I'm not the type of guy who runs behind someone else. I was going to run up front no matter what the pace was." "Samuel Wanjiru. He's a boxer. He runs like a boxer. I feel the way he approaches a race is like a prizefighter. When he races, he's in control. He makes a move -- he's the one making the move. Everybody else is responding to that. When he attacks it's like he's going for the knockout punch. As an athlete, I really appreciate watching that. I understand what it means." "Wanjiru called just after the marathon to say, 'Hey man, I got the gold!' Ever since his first year of high school Wanjiru said he wanted to be an Olympic marathon medalist. He did it so soon." "We cheered him on together as a former teammate. He is a great source of motivation for us all." Fukuoka-based Toyota Jidosha Kyushu has formally accepted the resignation from its professional running team of Beijing Olympics men's marathon gold medalist Samuel Wanjiru of Kenya. Head coach Koichi Morishita spoke to Wanjiru by telephone to confirm the gold medalist's intention to leave the company and accepted his decision on behalf of Toyota Jidosha Kyushu. Mayaka, Wanjiru and Team Sam manager Katsushi Fuchiwaki celebrate in Beijing. Photo by Mohammed Amin. "It was nice to be invited to the party given by Kenya's president, but even better was the one in Wanjiru's hometown. The whole stadium was completely filled. It was really incredible." Meiji Seika Chief of Operations Ryoji Kono with Samuel Wanjiru in Tokyo Nov. 28, 2008. On Nov. 28, Savas sports supplement maker Meiji Seika and Beijing Olympics men's marathon gold medalist Samuel Wanjiru of Kenya held a promotional event to formally kick off the company's sponsorship agreement. Wanjiru debuted the new Savas uniform he will wear in competition and announced plans to appear in TV commercials. The company would also pay Wanjiru $3 million over the lifetime of the deal. "Next year I'll run 2:03." "People can say, 'He's going to break the world record,' and people can say he's not. I think time is needed. He should take time and consider if he wants it. But it becomes difficult. You might feel, 'I'm going to break the world record,' but you can't. The weather might be bad, you might have troubles in your stomach, but one day it will be. But that's not something that you have to promise." 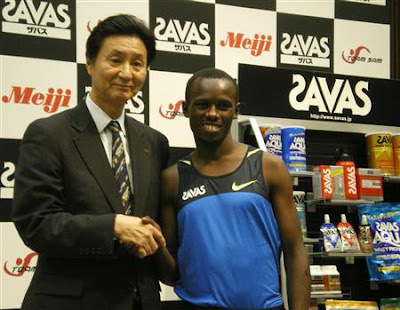 On Dec. 1 the Meiji Seika corporation announced that on Nov. 30 it had terminated its sponsorship of Beijing Olympics men's marathon gold medalist Samuel Wanjiru (23). In November last year Wanjiru signed a lucrative one-year contract with Meiji Seika to endorse the Savas sports supplement, but this year the company declined to renew the contract. A spokesperson for Meiji Seika cited "a change in our marketing plans" in explaining the move. The company is also cancelling the official team registration of its Team Sam. "He was not paid. That man was not honest, going around saying he could get Wanjiru for races, and that caused many problems. He told the Sapporo Half that Wanjiru would run, but he never asked Wanjiru." "Wanjiru has long since gone back to Kenya, now. He’s strong enough that he knows he can run and win and that the money is going to come in. How much does he get for winning, $100,000 something? More if there’s a course record. Looking at him, you know he is getting even more for just showing up. He ran for Toyota Kyushu for a long time and then just left suddenly and said he wasn’t going to do it anymore. He won the Olympics, so wherever he goes he's going to get first-class treatment. Whatever he wants. 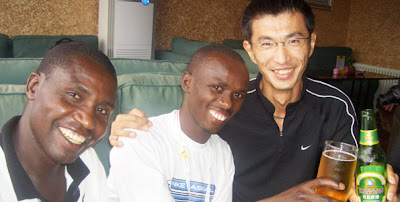 For Wanjiru, he won Fukuoka, he won Beijing, whatever marathon he runs he's not going to lose. That's going to mean a lot of money. I saw him in Nairobi recently and he said, 'Oh, Mr. Akiyama, dinner’s my treat tonight.' That's the kind of rich man he is now. When he was here he had a good salary, but not that much if you compare to what he gets now. In one marathon now he can make a year’s salary if he wins and you add up his prize money and his appearance fee. But not all Kenyans can do that. When Kennedy Manyisa went back to visit in Kenya people were approaching him about running Boston, telling him he could get $150,000 and a Mercedes if he won. But he never got it. The very top people in Kenya had deceived him by talking about the money he could make. It’s still the same way now. 'Hey, leave Japan, you should come back home and work from here.' But when they do they find that their wife has left and taken everything with her while they were in Japan. There’s nothing left. That's pretty much the way it goes, you know?" "I've patched things up with my wife. You don't have to worry." "After the Beijing Olympics I got phone calls from Wanjiru several times. He said, 'I want to come to Japan again,' and he sounded good. Just this past December he called me and said, 'I want to come back.' I think he wanted to get away to somewhere he could settle down and concentrate on his training. He was the moodmaker of the Toyota Kyushu corporate team, and by doing it himself he showed us how to train to win an Olympic gold medal. He learned gaman in Japan, and we all expected him to do well at the London Olympics. It is truly a great loss. Even though faster runners have come up recently, even now I think he was the best there is. He had both power and a sense of tactics. He still had so much more to do. It is a great waste." "I am totally shocked of the news of the death of Sammy Wanjiru. Of course one wonders if we as an athletics family could have avoided this tragedy." Wanjiru helping Sendai Ikuei H.S. to break the course record at the National High School Ekiden Championships in Kyoto, Dec. 26, 2004. "I can't believe it. It was so sudden, so unfortunate. I have many good memories together with him." "At the National High School Ekiden when I was a freshman I went to Kyoto to watch and saw Wanjiru run. He made the sign of the cross on his chest, then began to run." "When he was a senior he was part of our 2004 team that set the National High School Ekiden record of 2:01:32. I always thought, 'Samuel is going to break that time some day.' He was a friendly young man, with a personality like a Japanese person. The Wanjiru I knew was very honest, hard-working and loyal, the one who won an Olympic medal. My strongest memory of Wanjiru is that on the very first day he came to training at Sendai Ikuei he said he was going to become an Olympic medalist. Among all the students I have coached he was the most shocking, the one who made the biggest impact on me. It is devastating, I am utterly empty, angry and grieving. I don't know why he had to die. I am suffering because I don't know how to understand this." Wanjiru after winning his last race, Chicago 10/10/10. Shocked of course and saddened. What a thrill it was to watch him race. Loved his form and the guts he showed when racing. As Geb said we need to think about how to protect our own better! A few years ago Jonathan Beverley at Running Times contacted me about going to spend some time with Wanjiru observing his training for an article Jonathan was planning. It didn't work out, so my only direct contact with Wanjiru remains one fleeting second. At the 2007 Fukuoka International Marathon, Wanjiru's debut, I was running outbound on the out-and-back in the second half when Wanjiru and Merga came back the other way with Atsushi Sato just behind them. I cheered for Sammy and, maybe surprised to hear someone calling out in English, he turned his head to the right quickly and we made eye contact for a second. That, and Dr. Helmut Winter's superb, moving picture from last year's Chicago, will be my lasting memories of him. Brett, you always hit the nail on the head, it's what people--sorry, RUNNERS (well, I guess we're people)--want to read. Thanks! Such a tragic loss. Nice post. I am still stunned. I can't stop saying, "What the hell?" to myself. As quickly as the candle is lit, it can be blown out. This is hitting me harder than I expected as I am sure it is hitting others as well. Will never forget him hiding in the shadows over the last couple of miles in Chicago. RIP Sammy. great post; thanks for compiling those quotes, brett. is there any way we can view dr. helmut winter's pics (of Wanjiru)? I was Samuel Kamau wanjiru mentor from 1998 and untill the day he went to Japan in 2002, so if anybody want to know the true story about his, contact me at ndungustephen15@yahoo.com, will also link you to his Mother, Hannah Wanjiru.